Hello Speedway, my old friend. Usually when I play a single-player game, I go through it from start to finish. I play each new level after the last one, until I stop playing or get to the end. That’s not how I played 2016’s excellent episodic Hitman, however, and it’s not how I’m playing its fantastic new sequel. I’ve played almost every mainline Hitman game since the first came out in 2000. With the exception of 2006’s superlative Blood Money, which I replayed quite a bit, I played Hitman games like linear action-adventure games. I was aware that you could replay levels to try to get higher scores or different outcomes, but I mostly just played each level once and moved on. 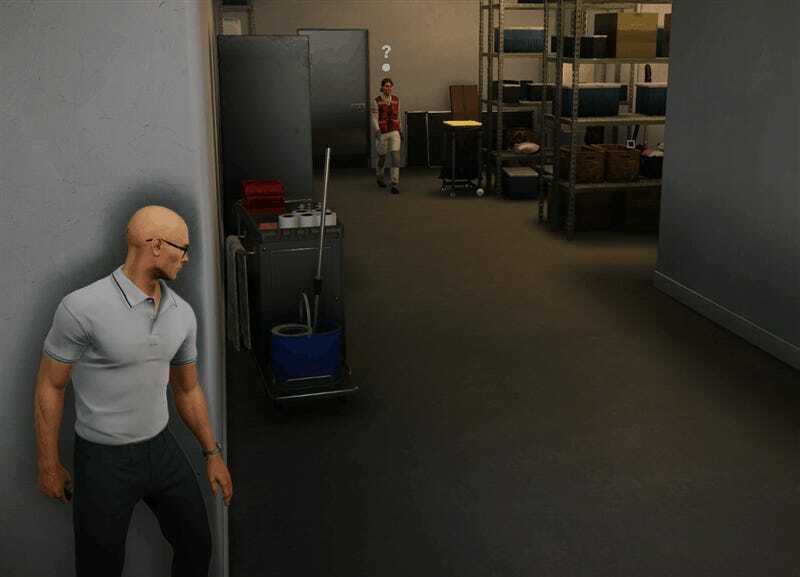 Hitman 2, which came out Tuesday on consoles and PC, was released all at once. There will be plenty of post-release downloadable content, but the main storyline and the main story levels are all available now. It’s as if a network TV show were acquired by Netflix during the off-season; what was once drip-fed is now bingeable. As with the completed 2016 season of Hitman, it would be possible to install Hitman 2 and blow through every level in a handful of hours. Fortunately, thanks to the many hours I spent repeating and mastering each of its predecessors levels, I’ve been trained to play it in a better way. I’ve put a half dozen hours into Hitman 2, but have yet to get past the first major level. 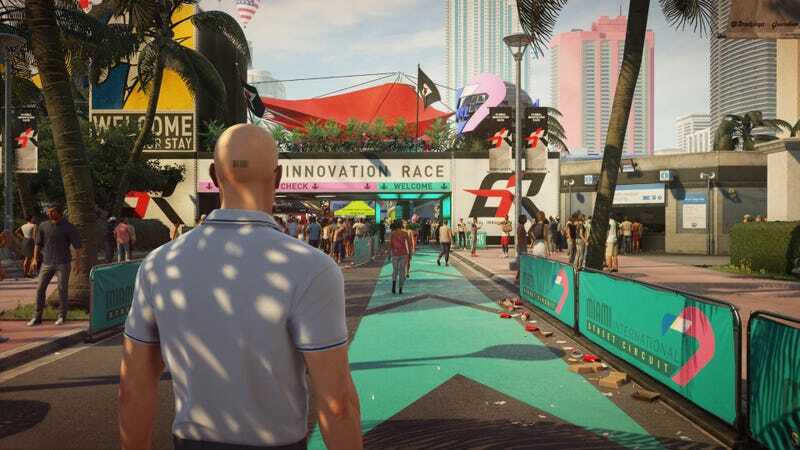 That level is set in and around a motor speedway in Miami, and is sprawling and fascinating even relative to the towering level-design bar established by the 2016 game. There is so much going on, with a seemingly limitless number of ways for Agent 47 to take out his pair of targets. I’ve completed the mission three times, only just nailing the elusive “Silent Assassin” rating on my third try. Each time, I’ve discovered new ways to complete the contract. When I look at the Destinations tab in the game’s main menu, I see that I could go on to the next level, which is in Santa Fortuna, Colombia. In fact, I could play any of the other destinations in any order—a nice, if somewhat overwhelming amount of options to be given. Playing each mission in order would allow me to see the rest of the story, though the narrative is so convoluted and messy that I’m not sure it would make less sense if I played it out of order. So far, I’ve happy ignored all of that and focused on the speedway. As I’ve discovered new options and strategies, the designers have been rewarding me with improved options for the next time I play. I’ve unlocked several new stash spots in Miami that I can use to hide additional gear and weapons, as well as a handful of new entry points to the level. More crucially, by playing through the level multiple times, I’ve unlocked…knowledge. I know where to find like four different screwdrivers, any one of which would be essential for sabotaging several crucial pieces of equipment. I know how to easily bypass the security guard at the speedway entrance, which allows me to carry a weapon into the crowd unhindered. I know where to find a bag of sugar, and where I can go to surreptitiously pour it into a certain race car’s fuel tank. Like all Hitman levels, the Miami speedway ticks along like a self-contained clockwork village. I’m starting to memorize the movements of the gears. I know where there’s a security guard (and his somewhat useful security guard outfit) catching some zzz’s all by himself, down in the garage. I know where a member of the pit crew is taking a leak. I know how to easily erase the security camera footage for the expo center. I know how to quickly get to the top floor of the center, out a window, and onto a catwalk overhanging the racetrack. I’ve gotten really good at throwing a fish at people. I understand that IO put a throwable fish in this game specifically so that people like me would share gifs of it, but I can’t help myself. For all the knowledge I’ve gained, there’s still so much I don’t yet know. Each time I play through Miami, I learn something new. I find new areas and possibilities to explore, and form an ever-more-detailed mental map of the level. As IO begins to release escalation sub-contracts and, soon, the sequel’s first single-attempt elusive target, the information I’ve gleaned thus far will doubtless prove invaluable. So, Colombia can wait. I’ve still got business in the 305.